Here's the thing about being vegan. You can eat things that are just like the stuff you're used to eating. The difference is, because everything is plant based, it's generally healthier...plus no one had to die or suffer so you can eat it, in case you care about that kind of thing. The Hubby was working late, so me and the Tyrant decided we'd have a junk food dinner night. We started with french fries....good God, don't buy the bagged stuff! Just cut up some darn potatoes and put them in oil. Crank up the heat and voila, fries! I saw it on America's Test Kitchen and it worked amazingly. Then we were of course still hungry, so we decided on nachos. 1. I started with organic chips from Costco...my Costco has almost no vegan products...wtf? 2.Then I poured on some vegan nacho cheese. I use Hot for Food's version, although I used the starchy water from boiling the potatoes instead of non-dairy milk, cornstarch instead of arrowroot powder, and a hot pepper from my garden that I pickled in straight vinegar. Don't let not having the specific ingredients stop you from trying things, just make substitutions, it'll be okay. 3. I quickly sauteed some black beans (I always use dried, cook them in the slow cooker and freeze them in mason jars) with a splash of oil, some onion and cilantro. Threw those on top. 4. I added some taco "meat" I made with Gardein beefless ground beef. I didn't use a recipe, but I cooked it with some onion, garlic, cumin, chili and coriander powders, tomato paste, Maggi seasoning sauce and the BJ's organic ketchup, in lieu of brown sugar, because it's crazy sweet. 5. I made the vegan cashew sour cream, also from Hot for Food. I use that stuff in place of mayo on my sandwiches, it's delicious. Make sure you soak your nuts for a few hours, at least. I only soaked mine for maybe 20 minutes and the sauce didn't come out nearly as smooth as it does when I soak them overnight. 6. Finished off the nachos with cilantro and some chopped garlic chive blossoms. I'm not going to run the nutritional numbers for you, because I'm lazy. But I'm going to guess that vegan nacho cheese is healthier than a big block of plastic looking Velvetta. 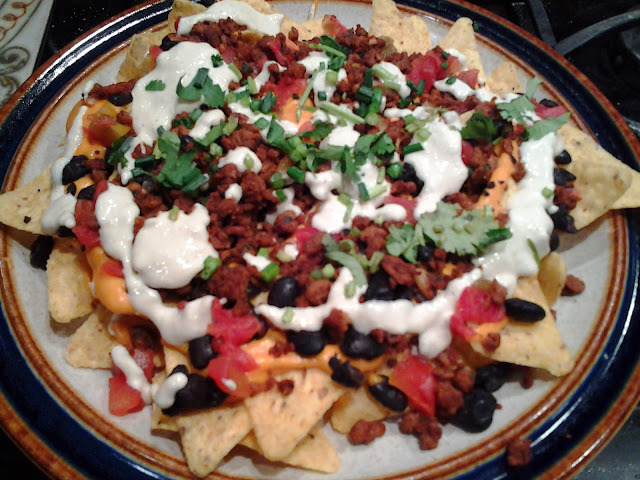 We all know beef is full of fat and artery clogging properties, beefless beef is plant based and while high-ish in sodium, I bet this whole dish had less sodium than your average plate of nachos (plus I only used maybe a 1/3 cup of "meat"). Black beans made from scratch have only the salt you add and lots of fiber. Cashew cream sour cream, obviously better for you than dairy. My point is, vegans still eat what everyone else is eating, just healthier versions. You don't have to be vegan for ethical reasons, why not just because you don't want to be obese and have a heart attack. Just saying.